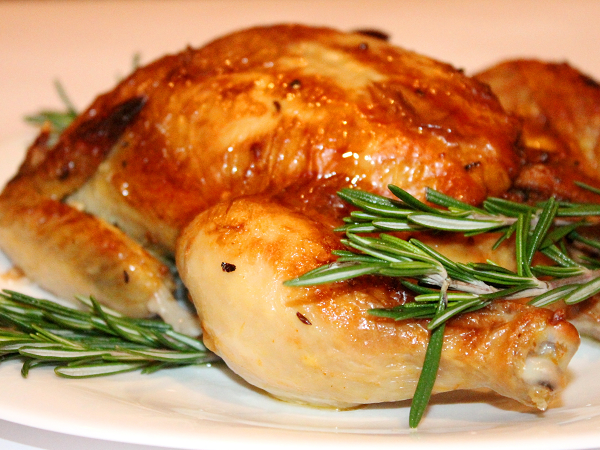 The rich fragrance of roasted bird is hard to resist such delicious not refuse. Cook the chicken in the yogurt in the oven for family dinner or holiday gathering, and no one will go hungry. How to cook bread in the oven. Wash the chicken, remove if necessary, the remaining feathers with fire from a match or lighter, cut off the excess skin and fat. Dry the bird with paper towel and place in a deep bowl or container. Separately mix the yogurt with soy sauce, salt, pepper, turmeric, marjoram, dried dill and crushed Bay leaf. Peel garlic and grate on a fine grater or crush in a mortar and add to the marinade. Stir well and liberally coat his chicken and outer. Leave it for about 5 hours in the refrigerator. Preheat the oven to 200oC. Cover it with a thick-walled high-temperature form foil mirror surface up, RUB it with vegetable oil and place it on the bird. Pour it in the bowl of the remaining sauce and wrap tightly. Put the dishes with the silver package on the middle shelf of the oven and cook the chicken in buttermilk for 1.5 hours. Remove the coating or just nadorite on top to brown the dish for 5-10 minutes before end of cooking. Prepare the chicken as described in the previous recipe, and cut it into pieces – thighs, drumsticks, wings and breast halves. Wash the potatoes, cut off the peel and cut the tubers thick slices or circles. Fold the bird and the vegetables in a large container. Pour in yogurt spices, peel and grate there grated ginger, stir and pour. Soak them in the marinade for at least an hour. Complete fragments of chicken, potato and halves of cherry tomatoes, a package or sleeve for baking, print it ends up and secure with knots or with the supplied clamps. Puncture resistant film with a toothpick in the top, so that the steam can come out during cooking. Bake the chicken in the yogurt in the oven at 210oC 60-75 minutes. Gently tear the package, put its contents on a dish and sprinkle with chopped herbs.